Bokonon23 left a comment that he wanted to know more about calculating the correct correspondences for Goetic entities, so here's a little more detail on the subject. I used 777, the correspondence chart developed by Aleister Crowley (from Alan Bennet's notes, probably) when he was still a member in good standing in the Golden Dawn. This correspondence chart was published in 1909, and reflects the Golden Dawn attributions to magickal subjects. To use 777 effectively, you must understand how information is presented in a spreadsheet or table. "Columns" are the vertical data sets, and "Rows" are the horizontal data sets. The first column is the "key scale," the number that will provide the common reference point for all other columns of data in the table. There are 35 rows of data, and 183 columns of corresponding attributes, items, angels, god names, goetic entities, plants, perfumes, etc. This compendium of information is extremely useful to magicians of all types. To find the correspondences of a particular Goetic entity, first find the entity in the columns of goetic spirits (Columns CLV-CLXV, or pages 27-28 [printed page numbers] / 36-37 [pdf page numbers]). Bune/Bime is found to correspond to Key Scale 25. Knowing the spirit is associated with Key Scale 25, I then went through the other columns in the table to get an idea of what correspondences related to Bune. All the information in the row labeled 25 had some relation to Bune. Since I was making a physical pot, I paid special attention to the physical items associated with Key Scale 25, the plants, the incenses, and the magickal weapon. I also checked the color charts for selecting the appropriate colored candles to use as offerings for the spirit. Since I am primarily interested in physical results, I used the color charts associated with the material realm, Assiah, which is called the Empress Scale in the Golden Dawn. I'm experimenting with different ways to use my spirit pot. From what I can find on the internet about spirit pots in hoodoo and the spirit cauldron in Palo, offerings to the spirit are made by placing the offering in the general vicinity of the pot. So far my offerings have consisted of lit candles. The reason I chose Bune, as I said in an earlier post, was because one of his powers is to bring riches unto a man. (From the Crowley-Mathers edition of the Goetia.) I am a Taurus, and while I have learned to be content in all things, whether poor or rich, I still prefer riches and oppulence to being consistently overdrawn in my bank accounts. One of the things I learned early in my magickal career is to always be very specific in what you want when doing magick, and even then, don't expect the outcome to be exactly what you intended. At best it will be exactly what you asked for. With this in mind, I sat down one afternoon and figured out exactly how much money I would need to have the lifestyle I desire. I want a nice-sized house in a good area, to pay for the vehicles our family requires, and enough residual income to make around $100,000 a year. I also specifically want this money all at once, not just an opportunity to make the money over 16 years of labor. Knowing that I would be paying axes on a lump sum, I added that to the initial amount, and came up with a figure of $7,142,857.14. Last night I created a talisman that included the exact dollar amount, my intent, and the names of God used in evoking Goetic entities, crowned with ADNI MLK, because the intent is to have this manifest in the realm of Assiah. 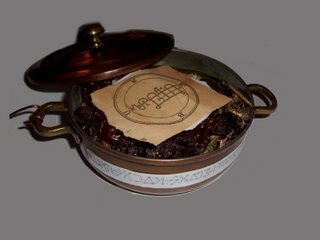 I placed this talisman in the spirit pot and lit three candles around the pot, and anointed the pot itself with the Oil of Abramelin. Anointing things with oil and waters seem to be a big deal in hoodoo, and the Oil of Abramelin is a very potent thinner of the veils. Rest assured, I will post the results. Any suggestions from more advanced users of the spirit pot are welcome. Comment below. I've recently created my first, and possibly last Spirit Pot. "Spirit Pot" is a term I picked up from reading a very little bit on hoodoo and root work. It basically presents a dwelling place for a particular spirit to live in. I first thought of this while reading an excellent article by Aaron Leitch in the Journal of the Western Mystery Tradition. In it he discusses the links between the Solomonic tradition and Folk Magick. He pointed out that there is a brass vessel discussed in the Lemegetton that has similarities to the Spirit Pot of hoodoo traditions, and I set about creating a spirit pot for one of the entities from the Goetia. I selected Bune/Bime as the spirit I wished to have in my pot. He is the 26th spirit of the Goetia, and has two seals that can be used to get in touch with him. I went to 777 to see what types of things to include in the pot. Bune is associated with key-scale 24, if I remember right, and I found that the plant for this key is rush, a type of grass, and the incense was lignum aloes. The magickal weapon is the arrow, and the astrological sign is Sagitarius. I purchased a length of woven rush grass and wound it around the base of my spirit pot. I included dates and raisins, some incense containing lignum aloes and sandalwood, and carved a small arrow out of cedar, using the needles of the branch as the fletching. I drew up a Seal of Solomon from the Goetia, and set it in the lid of the pot. I drew one seal by hand, and included another seal I had printed off the internet. As I drew the seal, I felt the spirit's presence begin to build up in the area. I created a triangle of manifestation, placed the seals in the pot, and the pot in the triangle of manifestation. I then began lighting blue tea lite candles for about a week, which burn for about five hours as offerings to get the spirit's attention. On a Sunday night when the moon was right, I performed the conjuration. I did it rather simply, and made very quick contact with Bune. I spoke to him about why I wanted to work with him, showed him the pot, and asked if he would live in it. He was VERY agreeable. Since then I have begun to experiment with the Spirit Pot. I chose Bune because he is allegedly related to my sun sign in my natal chart and because one of his abilities is to bring treasure, and I very much desire to be wealthy. I have also included the hebrew words found on the sides of the brass vessel in the Goetia, written in Celestial script from Agrippa's third book of Occult Philosophy. I've had some interesting conversations with members of the Ritual Magic yahoo group, and I hope to provide an interview with one of the members in an upcoming post regarding his views of the Spirit Pot as a spiritual condenser. I finally got my camera up and running, so I'm posting a picture of my Spirit Pot at long last. For the purposes of this post, a "Portal" is defined as a gateway through which communications with non-corporeal entities can be established. All magickal acts consist of working with non-corporeal entities, whether they are gods, demons, angels, egregores, eidolons, or servitors. I prefer the term "Spirits" to non-corporeal entities. It's more personal. The entities we work with are generally self aware to some degree, and thinking of them as cold constructs with no will of their own can lead to all kinds of problems later in your experiences with the spirit realm. To get the spirits' attention, we have to open a portal between our normal reality and the realms they exist in. There are many ways of accomplishing this, but all seem to include intoning specific god-names. The Druids are recorded as calling out their curses on the Romans, and throughout the Eastern mystical paths mantras are intoned to bring about access to higher states of consciousness. I don't know what the mechanism is, but vibrating aural tones creates changes in the environment. Once the environment has been changed through the intonation of the "words of power," it is necessary to get the specific Spirit's attention. This is done by having an image of the spirit on hand. There are catalogues of the symbols and seals of the spirits we have made contact with as magicians over the centuries contained in grimoires and described in sacred texts. Having the symbol or talisman of the spirit we wish to contact, we call the spirit by its name(s) and ask/order it to appear by the "power" of various associated god names. I believe that vibrating these god-names further tunes the portal that is opened at the beginning of the rite to the specific energies that are compatible with the desired spirit, and incompatible with any other spirit. When the environment is sufficiently tuned, the spirit can appear, and communications can commence. In the Lemmegetton, there are records of the spirits appearing at first in forms that are horrible to look at, and acompanied by noxious fumes and gases. To eliminate this, you are instructed to hold a ring in front of your face inscribed with specific names of God, and to order the spirit to appear in a particular form by the power of specific god names. I think that what might be happening is that the connection of a partially tuned portal must be more finely tuned once the spirit begins to appear. After this has been accomplished, the spirit is comfortable and can communicate quite well. In 1918, Aleister Crowley performed the Amalantrah working in New York. During this ritual, he opened a portal to other dimensions, and called various entities through it to communicate with him. One of these entities was LAM, which resmebles what we now call "Greys," those pesky aliens that are seen during what science calls sleep paralysis and occultists know as night hags. After he finished the Amalantrah working, he carefully closed up the portal he opened. Years later, in 1947, Jack Parsons and L. Ron Hubbard performed the Babalon rite. They were attempting to create a Moonchild, a human body that contained the spirit of Babalon from Revelations. It is postulated among many occultists that the rift they opened to draw down the star spirit was never properly closed, and this portal remains open to this day. 1947 marks the beginning of the UFO sightings that swept the world. Another connection between the interdimensional astronauts and the occult. As this example demonstrates, there is an important need to close a portal after you've communicated with a specific entity. This is done rather simply by performing an LBRP. Thank the GD for that contribution. Just what are those spirits up to? Have you ever wondered why exactly the spirits are so helpful? For years I suspected there was some plot or conspiracy behind what was going on, from the GWB to the Illuminati. When I went through a fundy phase, I was convinced they were demons trying to lead me away from Christ (never mind that they all pointed me back to Christ anyway). In my secular human phase, I assumed the advanced technology of some members of society was being used to manipulate otherwise talented individuals to keep them from interfering with the plan for interdimensional control. I think I've finally got it figured out. It has to do with their intrinsic nature. Each of these spirits is a self-conscious non-corporeal intelligence. It was created (or emmanated) in order to direct a current that influences manifest reality. For instance, Jupiter is an aspect of God that is assigned to dignities, prosperity, and offices of authority. Venus is an aspect of God that has influence over the domain of the heart. They each have a set of skills and talents that they're really good at. These spirits are helpful because that's what they do. They want to spread love, or assign dignities. That's what they exist for. While they have general work to do, every time a specific mage calls upon them or their representatives, they have the opportunity to work with another intelligent aspect of God that wants to communicate with them. It brings them joy. Why would you want to talk to angels or demons anyway? Contacting Spirits that move between the aetheric planes is a relatively simple process, I've found. Whether you're looking to speak with an archangel of a sephiroth, an earth-bound (i.e. goetic) demon, or a planetary intelligence, they're ready to talk and are just waiting to get in touch with you. The process is simple: draw the symbol that represents them, open a portal to their dimension, and then ask them to show up. But why would you want to meet them? For years in my occult practices, I truly believed I had no interest in working with them. I would do a Lesser Banishing Ritual of the Pentagram (LBRP), and sure, that involved calling the four archangels that surround the throne of God, but then I would go on to do whatever ritual I had in mind at the time. Usually, this was either financially related or emotionally related. Either I was trying to get more money by landing a better job, or I was trying to bring peace to an emotionally chaotic situation in my life or in someone else's. Occassionally I would perform a healing ritual for my sick friends. What I've found out lately is that I've always worked with "spirits." Whether they are gods of a pantheon, or a sigil I created in my harried Chaos Magick days, the fact is that I would summon intelligent autonomous entities to provide energies to create change according to my will. Since receiving this revelation, I've begun studying specific catalgues of spirits, and I've found an amazing set of well-defined, documented entities that have greatly expanded my ability to perform targeted magickal rituals. Whether I work from the Goetia of the Key of Solomon, the Archangels of the Sephiroth, or the Olympik Spirits of the Arbatel, I've found that they are incredibly responsive and willing to perform their assigned duties as quickly as possible. This knowledge has translated to incredible power. Not the "power-mad, dominate the entire universe and reap untold wealth and glory at the expense of all others kind of power," the physics potential-energy power. So why would you want to contact spirits in your magickal path? Because that's the way magick is done. All magick is based on contacting god in his infinite rays, or the representatives of his energies as they manifest in this world. Are you trying to raise the tincture of your sphere to become a better person and advance in the Great Work? Evoke the spirits that exist in the realm of Atziluth of the qabalah. Their very presence will begin to transform your own sphere, raising your tincture (tincture refers to the vibrational level, the intrinsic quality) of your sphere, your soul. Looking for ancient knowledge or hidden texts? The list of Goetic entities is replete with spirits capable of bringing you knowledge from the spheres. Entities from Briah and Yetzirah of the qabalah are also great at this. They bring books into your life related to the subjects you ask them about, or simply tell you what you need to know. How about getting prosperous or getting health? The spirits of Assiah of the qabalah work at the mundane, physical level. Being closely related to the material realm, they are wonderful resources for manifesting wealth, health and prosperity. I've recently joined a new yahoo group called EllenLlloyd. This group is dedicated to the Ancient Astronaut Theory, that the earth has been visited and continues to be visited by beings of an (or many) advanced civilizations who have either influenced or are directly responsible for the advancement of human civilization. I generally try to stay away from our Alien-conscious, UFOlogist cousines. I believe I have a better understanding of the phenomenon they report interacting with than they do. I'm sure they believe the same about occultists in general. However, I am not willing to reject their theories altogether. There are some amazing overlaps of our particular fields. For instance, today Ellen posted an article she recently wrote about the Everlasting Lights found in ancient tombs and reported above the temples of the ancients. Her article is good, and I recommend reading it if you have a few minutes to spare. A few months ago I was researching the Portae Lucis, the Portal of Light ritual. The goal of this ritual is to raise the tincture of the sphere of your soul by making contact with Binah-Saturn. It's very similar in effect to the Abramelin Ritual for making contact with your Holy Guardian Angel, and also similar in effect to Crowley's Liber Samekh. The goal of the ritual is to establish and empower a higher connection to the Divine source, sort of. I had first read about this ritual in an interview with Jean Dubuis by Mark Stavish at the Alchemy Website. In seeking more alchemical lore on the building of Houses of Light and Portals of Light, I found a treatise called The Everburning Lights of Trithemius. As most people who know me are aware, I am extremely fond of Johannes Trithemius. He was an abbot of a monastery who taught Agrippa, wrote some of the foundational texts on communicating with spirits, and wrote the original tale that became known as Faustus. Having read parts of the Steganographia and having practiced from the Art of Drawing Spirits into Crystals, I thought this treatise would be about the angels or spirits, and that it would be an allegorical reference to these entities as the "Everburning Lights." Imagine my surprise when it turned out to be a recipe for creating physical lights that one of his students had recorded. So today, when I read Ellen's article, I couldn't help but be reminded of the overlap between our fields of study. I personally believe that the "Ancient Astronauts" and the "Angels" or "Spirits" of the occultists are the same entities. For proof we have Crowley's Alamantrah working that resulted in LAM making his appearance, and the subsequent UFO phenomenon that occurred after Crowley established contact with that dimension's beings. By the way, that's one of the many reasons I don't combine alcohol, hashish, cocaine, ether and ritual magick. You just don't know what you're going to end up doing. But Crowley was a pawn his whole life, god bless him. Jack Parsons, father of the Space Age, did what he could to create a "Moon Child" or a Nephilim in his Babalon working. Plato was the first to say that every man and every woman is a star. Well, every man anyway, and that if you're not a rational man, you get reborn as a woman... That's not my fault. Read Timaeus sometime. Good stuff. Additional evidence is found in this Everburning Lights phenomenon. Where did Trithemius learn how to create these lights? We know from the other writings he is famous for that he was experienced in contacting the entities that travel between planes that we do not normally physically experience. His methods (or at least methods attributed to him) for contacting the angelic spirits work. I've spoken with Michael, Tzadkiel, and Haniel using the practices discussed in the Art of Drawing Spirits into Crystals (by the way, you need to include the sigils from the Magical Calendar and the method of creating Talismen from Agrippa's Book 4 of Occult Philosophy). The spirits of the Goetia and the Arbatel are useful for a lot of mundane things, but I find it extremely interesting that their primary functions are not to provide physical results, but to provide information. I believe Trithemius learned to make the lights from the Spirits. Those who believe in the Ancient Astronaut Theory believe the Everburning Lights are evidence that aliens have visited the planet and given us extra-terrestrial knowledge. What better term exists for the information we receive as magicians from interviewing the spirits than "extra-terrestrial?" This doesn't mean I believe the spirits "really are" aliens, or that there are no interstellar or inter-dimensional civilizations that influence humanity. Looking at the occult cosmologies of the ancient pagans, gnostics, and occultists around the world, I find it hard to believe that any magician would discard the theories of the Ancient Astronaut crowd completely. Our cosmologies are remarkably similar. Invisible entities bringing knowledge to mankind for our betterment, or for their own purposes. Think about it, what's the difference between the theories of Niburu and the Annunaki compared to the deliverance of the Qabalah to Abraham by Ratziel? The chief difference is that we as magicians continue to interact with these entities, while those of the Ancient Astronaut crowd seem to think that the aliens will be returning in some distant future. Then again, I'm not that familiar with the Sitchin followers and whether they believe the Ancient Astronauts are still working with particular individuals.